For some reason I missed this Guardian article about digital radio and technology wars at the start of this month. 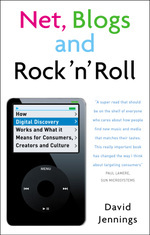 It includes much talking up of the additional features coming to radio (pause, rewind, text and even, whoopee, purchasing opportunities) and some quotes such as "People are impatient — they want someone to do the filtering for them, to pre-select some content and for it to be available instantly" which is just as unlikely as the opposite claim that people are only concerned with control and personalisation in their listening. A lot of commentators are more interested in which technical format will win out over the other. In this case it's DAB vs. 3G, but watch out for a tedious amount of speculation over whether Microsoft's music download service will knock out Apple's coming your way in the next few months. In the long term the people at either end of the supply chain — the 'curators' and programmers of music services, and the listeners — won't care about the transmission medium and storage device as long as it combines features for varying predictability, some kind of personal collecting, user-friendly navigation of massive collections, and some potential for innovative programming. That said, the article is worth reading all the way through, as is The Guardian's Special Report on Digital Music.